Traveling requires a lot of time. Especially when it comes to flying. It takes time to research and find the perfect deal on airfare tickets, and once you've found that, you show up two hours early to the airport where your time is dedicated to trekking through security lines, navigating through the airport, and rushing to your gate. Lots of waiting time is involved too, whether it is a long layover, waiting to be picked up, waiting to be dropped off, or maybe just all that dead time you have while you are actually in flight. It is hard to find good use of all that time when you are confined to one place and often times with limited or no wifi and/or mobile data. What is one to do? Unproductivity kills me. I know waiting is a good time for resting, but that is not what this entry is about. 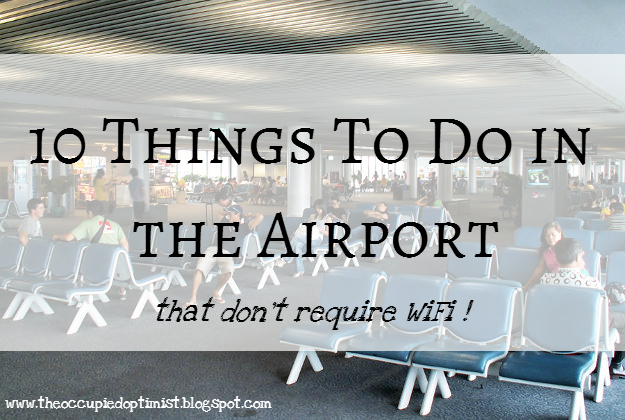 Here are 10 things I like to do with all my waiting time on travel days, and they don't require Wifi! Some of the things on this list are things that I really do desire to get done but are often just so low priority that I never get to them, and other things on this list are simply just healthy, enjoyable 'unplugged' activities that are good time killers to do in an airport atmosphere. Clean up phone storage. My phone often gets cluttered with horribly snapped photos, and unnecessary apps and downloads. Waiting in the airport is a great time to declutter your phone or any other devices you might have. I also like to take the time to close out all my recent apps/app running and clear phone call history and the worthless text messages too. There are so many benefits and conveniences to freeing up the storage space on your phone. Just make sure you don't delete anything important! Organize my iPod/iTunes. Maybe I am the only one that ever has to do this since I am probably the only one who ever still uses a stone age iPod classic opposed to my phone, when it comes to music. Regardless, the point I would like to make is that dead time in the airport or airplane is a great time to get your playlists straight. I tend to create playlist after playlist (I would consider it a hobby) but my iPod just ends up getting so cluttered! I reach a point where I can't stand it and have to delete and reorganize things. Sometimes things get uploaded with the wrong title, so I take the time to fix that. I also like to adjust certain labels to have my music organized the way I like it. Clean up/ Reorganize your agenda, budget, and/or calendar. Whatever needs to get done, Get'er done! You might want to make sure you look and think ahead and acquire some idea of what then next couple of days or weeks are going to look like for you, if you want to get the most out of your time wherever it is you are traveling too! I suggest you don't go crazy planning EVERYTHING down to a T though. You want to be prepared but keep in mind that there is an enjoyment to be experienced of the-freedom-of-having-nothing-planned so don't rob yourself some time of that. Plan ballet class. If you are a ballet teacher like me you may have discovered that travel days in the airport offer a beautiful amount of time for planning ballet classes! You even have an audience to try them out in front of if you so choose! Reading. Just grab a good book and read! Make a new friend. Who am I kidding? I am an introvert and I don't like talking to strangers. But if you do, go for it! Occasionally to kill time, I like to make phone calls to people I DO know. Crafting. Being in the airport for several hours could provide you an opportunity to get crafting, granting that your project requires minimal materials and is travel-friendly; such as crocheting, knitting, cross-stitching or making flowers! And yes all the needles required for the forementioned projects are TSA approved and permitted in your carry-ons, even scissors under four inches! Blogging. If you know anything at all about blogging, you know it requires LOTS of time! Have at it during layovers! With inspiration from all the people watching one can do, you're sure to come up with TONS of things to write about! Go for a walk. If you're wearing the right shoes, are traveling light, and have a lot of time on your hands consider getting up on your feet and getting some exercise by taking a walk around the terminal. Depending what airport you are in, there is a lot of exploring that can be done. Fun fact: the airport in Atlanta Georgia, the Hartsfield Jackson Atlanta International Airport is considered the world's busiest airport measured by its passenger traffic! Treat yourself. I think we all know that airport food can be pretty pricey, but it is okay to indulge and treat yourself now and again. If you have a super long layover, you might not have a choice but to dine out somewhere for your next meal. There are usually tons of wonderful places to choose from when it comes to grabbing a bite to eat in the airport. If staying within a budget is a concern for you, any of the major fast food chains are probably your best bet for saving money. Also, bring your own empty reusable water bottle that can be filled up at a fountain for free, once past security! I like to wander the shops and find completely crazy things to take pictures of! Haha! That's a great idea I've never thought to do! You are great with the camera! I always enjoy the photo's you share with us on your blog. And there sure are some completely crazy things in some of those airport shops! :) Thanks for stopping by and leaving a comment!